Dr. Qadir received his Bachelor’s degree from Princeton University, graduating with Honors. He received his medical degree from Tulane University, earning numerous awards including the E. Edward McCool Jr. Award for top surgery student and was inducted into the Arnold P. Gold Foundation Humanism in Medicine Honor Society. He continued his residency training in Orthopaedic Surgery at Boston University Medical Center in Boston, Massachusetts and the Ochsner Clinic Foundation in New Orleans, Louisiana where he trained under team doctors for the New Orleans Saints and New Orleans Pelicans. He completed an Orthopaedic Trauma Fellowship at the world-renowned R Adams Cowley Shock Trauma Center in Baltimore, Maryland, the only freestanding trauma hospital in the country and the oldest and most distinguished fellowship of it’s kind. A fellowship-trained orthopaedic trauma surgeon, Dr. Qadir treats general orthopaedic conditions and sports injuries, musculoskeletal trauma and complicated fractures as well as arthroscopy and arthroplasty of all major joints. 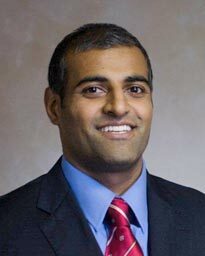 He has a special interest in direct anterior hip replacement surgery, total knee replacement, computer navigation and robotic-assisted partial knee replacement, total shoulder and reverse shoulder replacement, and revision joint replacement surgery. Dr. Qadir utilizes minimally invasive, muscle-sparing approaches to help optimize patient outcomes and minimize recovery time. Dr. Qadir has conducted a number of research studies as a primary investigator, earning prestigious grants from the Ochsner Clinic as well as AO North America. He has authored numerous peer-reviewed journal article publications and has presented his work locally, nationally and internationally, earning numerous academic awards for his work. He has previously served as Co-Chief of Orthopaedics at the Leonard J. Chabert Medical Center in Houma, Louisiana. He has earned various awards such as the “Patients’ Choice Award,” “Compassionate Doctor Recognition,” “Top 10 Doctor in New Orleans,” and “Top 10 Doctor in Louisiana” by Vitals.com. He currently serves as the Vice Chair of Orthopaedic Surgery and Director of Orthopaedic Trauma at Memorial Hermann The Woodlands Hospital, an acting level II trauma center. He also serves as Director of the Outpatient Joint Replacement Program at Memorial Hermann Surgery Center Woodlands Parkway. He is an active member of the American Academy of Orthopaedic Surgeons, AO Trauma, and the Orthopaedic Trauma Association. While at Princeton, Dr. Oadir participated in both Varsity Lacrosse and Football at the Division 1 level, including a NCAA National Championship lacrosse team. His athletic background gives him a keen insight into caring for the injured athlete and the desire for his patients, young and old, to return to a high level of functioning after major injuries.